A quick one today... Apparently, I wasn't too clear in pointing out the humor in Monday's blog. Here's the scoop. The image in Monday's entry is from the Shaler Municipal Newsletter. Look closely at the item beneath "Public Safety." Hahahaha! That amused my inner twelve-year-old. The Sunday brunch with the neighbors program concluded this past Sunday, with a lovely morning on the new neighbors' side porch. As usual, the dogs were not invited—everybody loves 'em, but Smithers is NOT a cordial guest when food is involved. This time around, it was our turn to bring the bagels. Now bagels make an important element of a nice brunch, but when there's french toast and eggs and bacon and sausage and pancakes and doughnuts and fruit and god knows what else, well, the bagels usually go begging. And so, we had about eight bagels to bring home. Not a problem. We'll give 'em a good home. But the new bagels reminded me that it was time to throw out the OLD bagels, leftover from two weeks ago. I tried to rip them up, to be thrown out for the birds—but 14-day-old bagels defy ripping. So I nuked them for 20 seconds. A little better, but still a pain in the arse. I shredded one, and threw it off the side porch and forgot about it. The rest went into the garbage. A little while later, I took the dogs around back. Big mistake. They smelled the bagel, even though it was safely hidden beneath the below-the-porch vegetation. They did their thing, and I marched them back into the house. At this point, Adam had performed a true rarity—he'd gone down for a nap. Normally, he is the baby who WILL NOT NAP, but brunching seems to take a lot out of him. With the baby snoozing, Julie decided to catch some zzz's herself. Smithers has a special way of letting us know when he needs to go out. We've tied two jingle bells around the door handle, and when he needs a breather, he nudges the bells. Works great, except that he also occasionally nudges the bells simply when he feels he's not getting enough attention. With wife and baby asleep, I sunk into the sofa with the Sunday paper, planning to alternate between reading and dozing. Ok, Smithers, I'm coming... Let the dog out, and he starts pulling. Usually, this means he'd like to be hitched up to the stake in the front yard. I stake him up, and go back inside to my comfy couch and newspaper. Whine whine whine whine whine. Ok, the dog wants back in. I trudge back out. The cycle repeats about five times, a new record. I take the bells off, and he sits at the door and whines. It's then that I realize what he wants. And I'm too tired to fight him. We put on the leash, and marched around to the side of the house, and had a feast among the stale bagel bits that are lying beneath the weeds. Yum. Stupid dog. Great sniffer—but stupid dog. What's the best part of living in Shaler? It's their attention to detail. 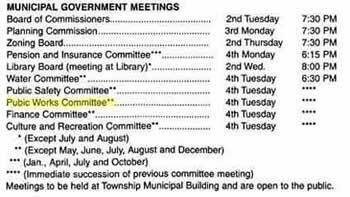 That, and the fact that they've put together an entire committee to make sure that...er...IMPORTANT ELEMENTS OF SHALER CITIZENS' BODIES are working as they should. Every fourth Tuesday is a barn-burner here in Shaler. Lost in the shuffle of the big news of the past couple of days, what with Usay and Quday becoming ead-day, and the ongoing fire sale at PNC Park, was the collapse of the Kinzua Bridge in McKean County. 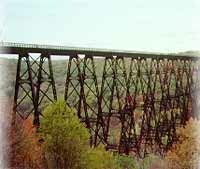 At one time it was the highest railroad trestle in the U.S. Today, if it hadn't succumbed to age and a tornado, it'd still be the fourth-highest. It's hard to imagine any of the top three being more scenic. Julie and I walked halfway across the thing a few years back. It was spectacular, but horrifying. I'm not too crazy about heights to begin with—and walking across railroad ties, which allow you to peer down into the abyss—well, that's as close as I get to thrill-seeking. It didn't help that I was carrying a fairly heavy video camera, as well as a sturdy tripod. It was a lumbering effort to get me out into the middle, I can tell you. Took a vacation day yesterday. Unfortunately, not for anything particularly fun, as you'll see. About a week ago, someone at the volunteer gig asked me to sit in on a board meeting where some new technology was going to be introduced. It's a common mistake—people see that I've worked for tech firms and figure that I must know something about technology. Ennhhh. Wrong answer. But that meeting was for 5 pm, which would've meant leaving work an hour early. I decided to see if I could get a much-needed dental appointment, and did—for noon. That meant half a day off. At this point, I'm thinking "why not clear a bunch of stuff off the to-do list." As long time blog o' love readers will recall, I spent part of last winter's sabbatical participating in a psych study for Pitt. I feel the need to stress that I was not asked to participate in this study because of any health (mental or otherwise) issues. They needed men aged 25 through 45, and I had some spare time and figured the cash would come in handy. I made it through three of the four required sessions before landing the new gig. I tried, unsuccessfully, to get them to squeeze in my final appointment before the new job started, but no go. And being a new job and all, I was a little hesitant to request a day off so early in my tenure. Anyway, long story short, I went and completed the study yesterday. Unlike the first three portions of the study, which were mainly memory exams and the like, this one was strictly physical, in the sense that they gave me EEG's, EKG's, and some loony breathing tests. At one point, I had electrodes stuck to my head, and then had to sit under a huge plastic bubble. Very Clockwork Orange, oh my brothers. Ridiculous, and not at all worth the minimal amount I got paid. Interesting, though, and now it's done. Somewhere out there is a study that may or may not prove that I'm wacko. Most of you probably could've supplied them with the answer to that WITHOUT all of the studies. Oh yeah—also managed to squeeze a haircut in yesterday, too. Nice to see the Pirates officially enter another round of salary dumping. I've managed to stay optimistic about the Bucs through the 80's, with the drug trials, George Hendrick, Sixto Lezcano, and through the last 10 years of the 5-year rebuilding plan—but this time, I've finally decided to throw in the towel and concede that this franchise is toast. They're done. Pack 'em up and ship 'em off, there's no hope for baseball in this town. And that makes me so goddamn sad I could just about cry both for the generation of my family that preceded me, and the brand-new generation. My mom was a hard-core Bucs fan. She would've been heartbroken at the current state of the team. And the fact that I may never get the chance to take Adam to a Buc game—well, that's too much to take. It was never my intention to be the go-to guy in the neighborhood in regards to lawn care. Some seek lawn greatness—others have turf spectacularity thrust upon them. Oh, yes, I DO attempt to keep the yard looking nice. But through some incredible twist of fortune, I've managed to develop a pretty swell looking turf, if I do say so myself. But I don't HAVE to say it myself—others in the neighborhood say it for me. A number of neighbors have asked me to share my secrets, such as they are. So here, for you, my dear friends, are Bob's Tips for a Snappy Lawn. First and foremost, and I cannot stress this first point strongly enough, travel back in time about twenty-five years and plant an oak tree in your yard. In a quarter-century, that baby'll be pumping out enough shade to keep your yard green and lovely while everybody else's is going dormant. Secondly, raise the level of the houses across the street from you so that all of the rain water rolls off their yards and onto yours. It's very important to let people know of the horrors of fertilizers. Be sure to speak out, loudly and stongly, against these environmental nightmares. I am dead set against fertilizers. In particular, I am against nitrogen-based fertilizers, as they are environmental disasters in the making. The use of fertilizers is very, very bad. Every spring, spread Scott's Nitrogen-Plus Weedkilling fertilizer on your yard. Do this early in the morning, which has several advantages—one, the dew holds the fertilizer onto the grass blades, and also, miraculously, holds the weed-killer on the weeds. The second advantage of doing this early in the morning, before the neighborhood awakes, is that no one can see you being a hypocrite on environmental issues. But they'll see your green, green grass and they'll know. Oh, they'll know. But you'll know that they know, so ultimately you win. Finally, and this is an important tip that I picked up from the head groundskeeper at PNC Park, where everything on the field is great except for the team that plays there. His tip is easy to remember. "Cut it high, and let it lie." I've raised the mower blades up to a lush three inches, and unless the grass is REALLY extra-long, I just use the mower's handy mulching attachment. No more bagging! And the mulch breaks down nicely and fertilizes its still-living brothers. Greater love hath no grass than to lay down its life for its friends. Also, and this one's important for you pet owners out there—be sure to teach your dogs to do their dirty, sinful business on the lawns of others. Ok, did I REALLY say that I'd have a new site up today? Well, no—no I didn't. What I SAID was this—that I was taking a week off to work on the new site. And I did. And it's progressing. Soon, this Web site will leap forward, style-wise, from the classic look of the Web, circa 1995, all the way to the finest that 1997 has to offer. Ah well. At least the content on these here pages will continue to...er...well, be a teensy bit better than the design. Ahem. Anyway, some progress has been made. Enough, at least, that I can continue to blog in good faith while I continue to tinker with the site. Also, expect a handful of new content areas within the next few weeks. The subjects of said content areas should be of interest to, well, maybe a dozen or so people, worldwide. But those dozen will be well pleased. So look for bloggage all this week. Chances are it'll be somewhat shorter than usual, which is a good thing for all concerned. Two short items of concern from the Sunday P-G. 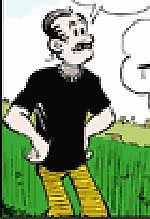 The first concerns the most disturbing image ever created by Family Circus guru Bil Keane. Hopefully, that image will be online within the next few days so that I may share it with you. The second item is this, a question sent in to "Hugh Scott's Personality Parade" in Parade Magazine. Someone's life was empty enough to actually send the following question: "What is Moose, the dog from Frasier, up to this summer?" Believe it or not, I think the answer had something to do with golf. This site was never supposed to look like this for more than a week or two. It's hideous, and I can bear it no longer. But I don't have the time for the extensive redesign I was planning—so, we'll do another patch job. Please excuse Bobby from his blog last Friday. He was ill er, I mean he had a doctor's appointment no, umm—kidnapped by aliens. That's it. Aliens. Ok, actually I was just lazy. Sue me. But the good news is that the time off left me extra refreshed and alert, which I needed in order to receive my weekly blast of superior journalism from the pen of Post-Gazette Sunday business columnist Linda Dickerson. This week, during my weekly session with Linda, it dawned on me why she has a weekly column in a mid-major metropolitan newspaper, and I have a blog that is occasionally perused by my immediate circle of friends. It's her innovative, in-depth style. She's hit on a formula that works—time and time and time and time and time and time again. Here, for those who've never figured it out, is "Linda Dickerson's" secret to "good" column "writing." First, talk to somebody. Preferably, the CEO of a tech firm, or somebody with a cool name, or somebody who peppers their speech with buzzwords like "leverage" and "customer-centric." Then, compile a whole bunch of that person's quotes together in random order. Write and insert about five original sentences, each of which paraphrases the next quote in your sequence. In other news from the Sunday P-G, I have a question—when, exactly, did Herb Woodley adopt an alternative lifestyle? And does Tootsie know? The pictures from yesterday's entry are from a small breakfast gathering thrown by my co-workers. A pleasant and generous gesture, indeed. Julie brought Adam up to my place of employment, and we promptly unhitched him from his car seat and didn't see him again until it was time to leave. They passed him around, and Julie and I took advantage of a few precious minutes of freedom to chow down and open some presents. Did I say presents? Yeah, there were presents, and nice ones, too, including a HUGE basket full of books, a sturdy and handsome little rocking chair, a generous gift certificate, and a little doggie-blanket type thing that I can see Adam dragging behind him for the next five years. Cute. All this from a group of people I've only known for a few months. Overwhelming. In other news, Pirate 1st-baseman Randall Simon was arrested last night for, pardon the expression, whacking a wiener. Milwaukee's sausage races are legendary. Four goofs dress up in sausage costumes (there's a bratwurt, a hot dog, an Italian sausage, and something else,) and they race across the field. Pittsburgh has stolen the idea for our pierogie races. Last night, during the sausage race, Randall Simon decided to interfere, and stuck his bat in the path of the hot dog. *CLUNK! * Right on the head of the 19-year-old girl inside the costume. She fell, and the racer behind her tripped over her. Fortunately, both suffered only scraped knees, but still. Stupid. After the game, Simon was taken away in handcuffs. Another PR bright spot for the miserable Bucs.